Aisakos S.A focuses on the representation, production and trading of raw material in a number of industrial sectors. Aisakos S.A has entered its third generation of activity, as it is effectively a continuation of companies that have been active since 1957. The company is committed to providing integrated services, always aiming to offer best solutions to its customers. It secures partnerships with producers who demonstrate recognized quality and has the necessary funds to retain sufficient inventory for 24-hour delivery. 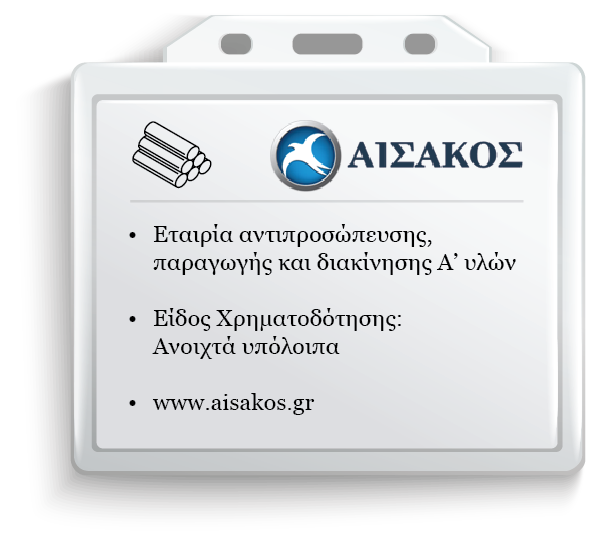 With the vision to become the leading supplier in all sectors that it serves, keeping customers fully satisfied, establishing an ideal workplace for its people and operating with an increased sense of social responsibility, Aisakos is moving forward with stable growth and healthy profitability. November 2017 was the first time that Aisakos required funding in order to cover a liquidity gap. The difficulty of the Greek banking system to provide financing to companies in general and the multiple bureaucratic obstacles that cause delays in any funding request, led Aisakos to look for an alternative source of funding. Therefore, and through recommendations, Aisakos found CNL Capital. From the outset, the recommendations we received for CNL Capital were excellent, and subsequently those were fully confirmed in practice. CNL Capital is characterized by speed, flexibility, simplicity and consistency. Its people have a high level of perception and deep knowledge of the market. Beyond that, CNL Capital offers funding solutions at a competitive cost relative to the banks which is of major importance to its customers. Collaborating with CNL Capital allowed the company to remain consistent with its suppliers and maintain its market credibility and the smooth continuity of all its activities. Our collaboration with CNL CAPITAL will certainly continue in future, as we now consider them a strategic partner in our funding considerations.